Robert & Jenna were married onboard the Disney Cruise Line on July 19, 2008. Jenna had actually never been on a cruise before, but she said it turned out to be the best vacation she's ever had. The wedding turned out exactly as she had envisioned. 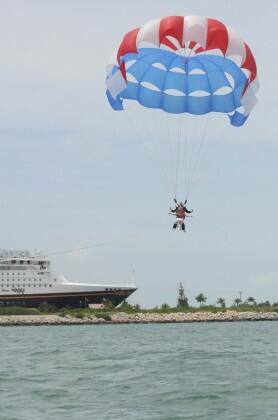 The ceremony was on Castaway Cay and the weather was absolutely gorgeous! 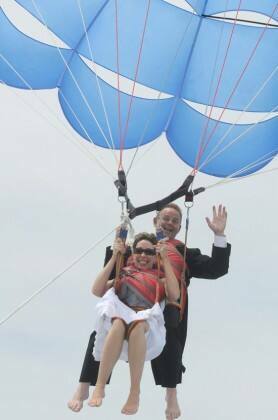 After the ceremony Robert & Jenna went parasailing ... in their wedding attire! Yes, that's her wedding dress flying in the air! They were both so relaxed, breathing in the air and enjoying a quiet moment together. That is what I call taking the plunge!